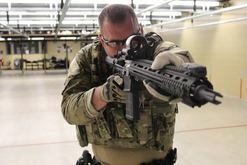 "Cole did an outstanding job instructing the firearms instructors’ course. Having been to a few of these classes in the past I have to say this was the best yet. Good job Cole! It was a wonderful class that was full of fun and educational information. All very useful to instruct the officers within our department. Thank again for the great course." "I would highly recommend the Firearm Instructor Course to anyone in the law enforcement community who want to improve their ability and take this expert knowledge and training back to their department. The instructor was second to none and has real world experience and training that shows in everything he does. You can tell that hi is very dedicated and skilled in his craft and has a great way of relating and teaching his skills to others." "This course is so valuable that I will bring back this information and train my department with it. Cole is a strong instructor and keeps all engaged. This has helped me to problem solve issues that arise, which is priceless in training." "The quality of information that a person gains from this course is unbelievable. I think every officer should take a similar class. Not only do you learn instructor skills but you learn so much more that will be used on the job." "Great Class! Student lead instructing on day 1 leads into an easy transition into running your own course of fire. Very hands on and practical training without unnecessary PowerPoints and boring lecture." "It is obvious Cole Cares and know what he is teaching. I highly recommend this class!"